Mixed chamber ensemble Some Assembly Required began in early 2015 as a collaborative effort between Boston professional and freelance artists to provide their audience with a unique musical experience, frequently venturing into repertoire that is rarely heard in public performance. Mixed chamber ensemble Some Assembly Required lives up to its moniker as the musicians collaborate with composers, guest performers, and their audience in the production of exciting, atypical, and carefully curated concerts. 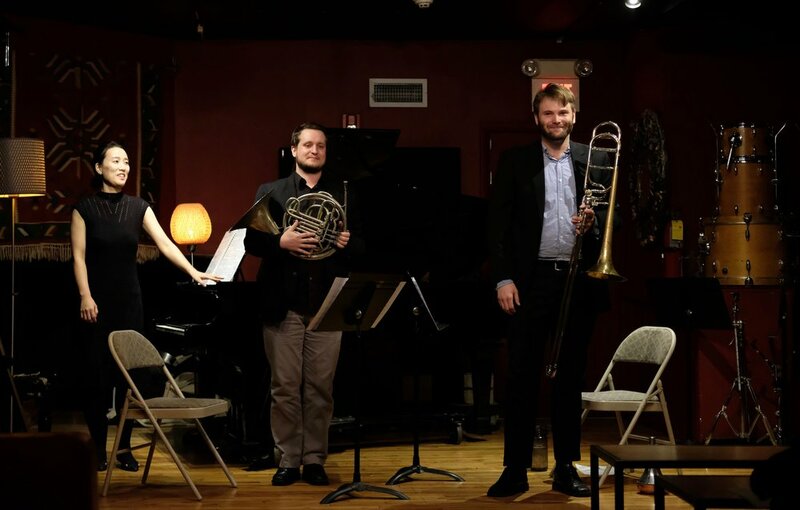 SAR was founded in early 2015 as a collaborative effort between Boston professional and freelance artists to provide their audience with a unique musical experience, frequently venturing into repertoire that is rarely heard in public performance. In three seasons, SAR has performed dozens of concerts in New England and across the eastern United States, from Kentucky to the Bronx. Not accepting the limitations placed upon them by the small amount of repertoire available for their instrumentation, SAR starts by choosing music that they want to present and then finding a way to provide a meaningful presentation of the music by methods of arrangement and collaboration. The core members of the ensemble strive to design programs that go beyond the traditional concert format by bringing the performers, audience, and venue into close contact. The 2018-2019 season finds SAR in New England with a program inspired by spirituality, and in Florida by programs inspired by our collaborations with Floridian composers. Throughout Cholong Park’s active music career, she has developed a wide range of repertoire and discovered that chamber music, contemporary works, and piano pedagogy are her forte. She was a featured soloist performing works at the John Cage Festival, the Pre-college Piano Symposium, and the New Music Ensemble Concert at Florida State University. In May 2014, Park made her Carnegie Hall debut performing solo and ensemble works as an essential member of the new music ensemble, What Is Noise, as their pianist. A native of Korea, Park is the artistic director of "Voices of North Korean Refugees," an arts series that raises funds for refugees of North Korea. Park received her Bachelor of Music degree in Piano Performance from Sang Myung University, her Master of Music degree in Piano Performance from Florida State University under the guidance of Dr. David Kalhous, and a diploma in Collaborative Piano from the Longy School of Music studying with Dean Wayman Chin. Trombonist Justin Croushore is in demand as a performer across many boundaries of musical style. As a classical musician, Justin performs regularly in various chamber groups and orchestras. Justin has served the position of second trombone with the Sarajevo Philharmonic Orchestra and also with the Cape Ann Symphony in Massachusetts. He is currently a member of Midwestern United States-based Auxilium Trombone Trio. Nationally recognized as a reggae musician, Justin has been thrice named a recipient of the Cincinnati Entertainment Award for best reggae/world music artist in 2011, 2012, and 2013. Currently residing in Lexington Kentucky and maintaining an active career as a freelance performer and brass pedagogue, Justin holds degrees from Bard College, The Longy School of Music, and Morehead State University. Croushore is currently a candidate for a Doctor of Musical Arts degree from the University of Kentucky. Hornist Justin Stanley has loved chamber music since he first encountered at age 12 when he played in his first brass trio in Texas. In Boston, he started his own ensemble, the Wenham Street Brass (2010-2014). Justin has performed with many ensembles including the Lexington Symphony, the Plymouth Philharmonic, the Lyric Stage Theatre, the Boston Opera Collaborative, the Boston Philharmonic, Evan Zipoyrn's Ambient Orchestra, Orchestra NEXT, the Newport Symphony, and the San Antonio Symphony, performing at such venues as Carnegie Hall, Symphony Hall, Jordan Hall, Mechanics Hall, and the Shalin-Liu Center. Currently in a doctoral program at the University of Oregon, Justin earned a Bachelors in Music at New York University and a Masters in Music at New England Conservatory.